And, in a random drawing, I won a $100 gift certificate to the Institute for Culinary Education! I am so excited! Have you taken a class at ICE? Or have any recommendations? You can see the course catalog (for all recreational classes, click on the tabs on top. A friend asked me on twitter to recommend stand mixers. I asked about her baking habits. I LOVE my stand mixer. I find that it makes baking easier, most recipes are written with a stand mixer in mind, and it makes the magic of frosting easier as well. But, it takes up significant kitchen real estate, which is a problem for me in my tiny Brooklyn kitchen, so it is only for serious bakers, or those who do quite a bit of baking. Last year (actually, before last thanksgiving, so happy one year stand mixer anniversary to me!) I asked for the Red KitchenAid Five Quart Model for my Christmas gift. Since I was baking for Thanksgiving, I asked for it early. I ordered it from the KitchenAid Outlet. It is a refurbished model, and only has a six month warranty, but otherwise the same model as new. I know other people have other types of mixers. I do recommend (if you can afford it) to go with a brand name such as KitchenAid or Cuisinart. If you do bread, and want to use the mixer to knead, I would not think about a smaller or less powerful mode. If you do gluten free baking, you want a more powerful stand mixer. If you do the occasional cake, and want to just not have to stand there for 2 minutes mixing the mix (nothing wrong with that!) you may be able to get away with a cheaper and less powerful model. 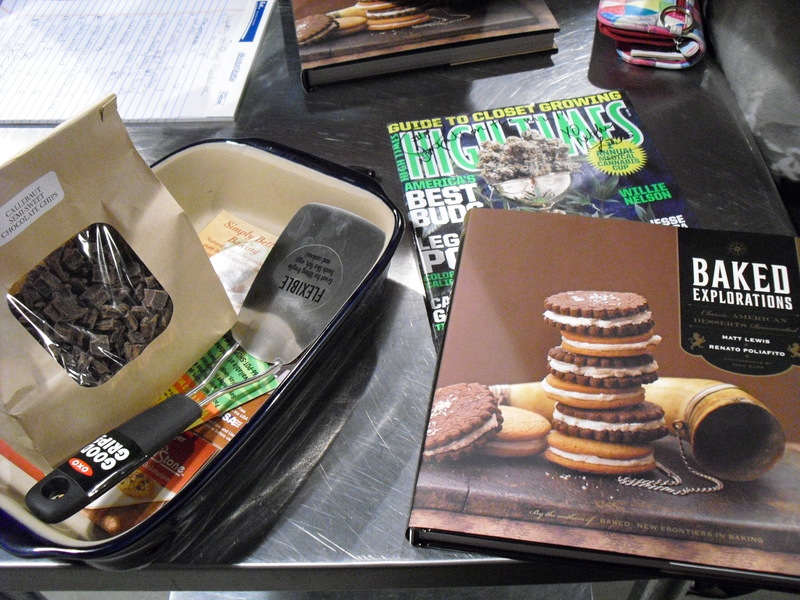 There was a small controversy at the judging table, and among some fellow bakers, that suggested that the taste of chocolate did not come through. I will agree. 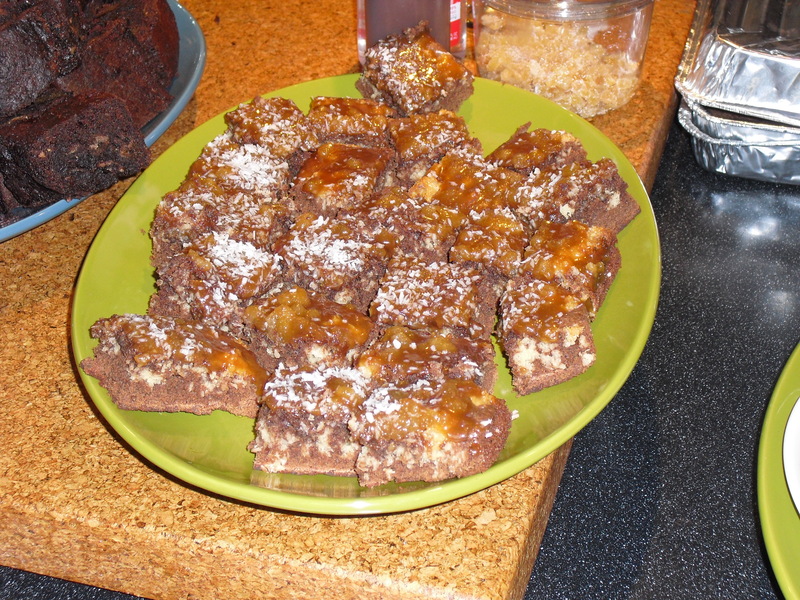 The brownie recipe is my Grandmother’s, and she stole it from someone else, so it is an older recipe. Compared to several other brownie recipes I have seen, it does not have a high percentage of cocoa in it, and it does not have any melted chocolate, so this will give you more of a cake like brownie than a dense fudge type brownie. Still, I grew up on it, and I think it is one of the best brownies out there. This has several parts. It is not necessarily a recipe that needs to be followed exactly, but rather a starting point for future explorations. I have made a few notes in places where I would modify it if I were making it again. Enjoy it! Place all ingredients in mixer bowl. Beat on medium speed for 3 minutes. For regular brownies, you can bake these as is. Bake at 350 degrees for 30 minutes. I did not measure this. It was approximately 7 oz of Sweetened Condensed milk (or about half the can) to about 5 oz of Coconut Flakes. 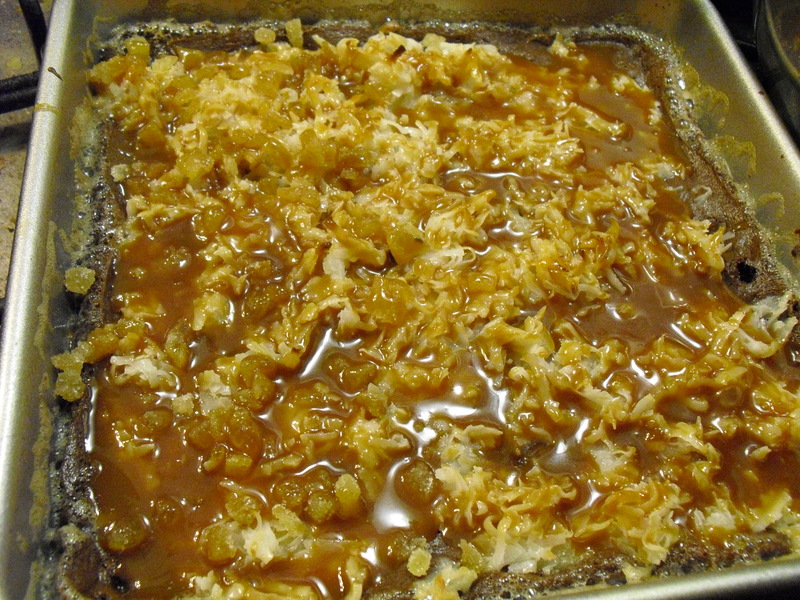 Stir together until you have all the coconut covered in the sweetened condensed milk. When I did it this time, it was very crumbly. Next time, I may try a higher proportion of sweetened condensed milk, or more coconut. Many people said that it did not taste enough of coconut. To make the layered brownies, place half of the brownie batter in a 9×13 baking pan. 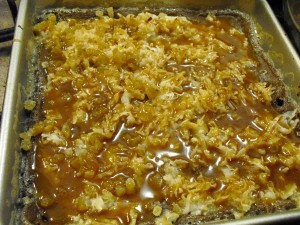 Top with all the coconut, sprinkled as evenly as possible. Top with remaining brownie batter. Bake for about 30 minutes, at 350, until a toothpick inserted comes out mostly clean. You can also make these just two layer brownies, with brownies on the bottom and the coconut on the top. I made a half batch (pictured above), which cooked for 22 minutes. The tallest peaks of the coconut were dark brown, but I think it would be fine in a longer bake for the full size brownies. Once it hits the temperature, pour in the heavy cream. Stir and boil until it is all combined. Then add the butter and sea salt, and turn off the burner. Dice Candied Ginger. Mix with Salted Caramel Sauce. Pour over cooled brownies.